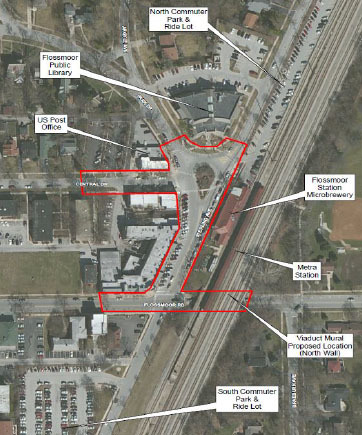 The Village of Flossmoor is taking steps toward redeveloping about 1,500 feet of roadways, pedestrian areas and streetscapes in its downtown central business district. central business district roadway redevelopment. The Flossmoor Village Board on Jan. 22 voted to give the OK to Baxter & Woodman Consulting Engineers to enter the project’s first phase, which will include planning, collecting data, conducting a topographical survey, analyzing alternate designs, considering drainage improvements and other steps. The first phase will cost $160,000 total, with the village to contribute 20 percent, or $32,000. The other $128,000 is being covered by an “Invest in Cook” grant that was awarded to the village last July. The consulting firm was commissioned to do a traffic study following an accident in August 2017 in which a mother and two children were struck and injured by a vehicle while crossing from a traffic island to the post office corner. Baxter & Woodman’s traffic study showed that numerous factors make the downtown area dangerous for drivers and pedestrians, such as bad sight lines, confusing signs and a difficult intersection where the traffic island and mailbox sit. Complaints about downtown traffic have been growing for years, officials said. Improvements are planned to take place along Park Drive, Sterling Avenue, Central Drive and Flossmoor Road within the village’s right of way. Some preliminary traffic control features were added to the downtown last summer -- including new striping, signs and a flashing stop sign — but they are considered temporary with the redevelopment project on the horizon. Dan Schug, a consultant with Baxter & Woodman, explained that Illinois Department of Transportation (IDOT) reviewers will be interested in knowing what design options the village has considered, including the possibility of replacing the problem intersection with a roundabout. A splitter island is a raised or painted traffic island that separates traffic in opposing directions of travel. They are typically used at roundabouts and on minor road approaches to an intersection. Schug said that although some drivers are unfamiliar with them, roundabouts are becoming more prevalent and should not be ruled out. Drivers would yield to pedestrians before entering the roundabout, and pedestrians would walk around rather than crossing to the island, he said. Public Works Director John Brunke said the project’s first phase, preliminary engineering, will take about a year, after which the village can submit for further grant funding for the second phase, final design engineering, and construction in the third phase. Construction is expected to begin in spring 2021, with the entire project to cost an estimated $2,087,000, Brunke said. He also explained that part of phase one will include gathering stakeholder input and working with the village board. The preliminary engineering report submitted as a result of phase one will go through an extensive review process with IDOT, he added. Mayor Paul Braun said he was pleased to see there would be community and business stakeholder involvement. “This is obviously a major project here for the community in terms of revamping downtown into a future, next-generation downtown area,” Braun said.